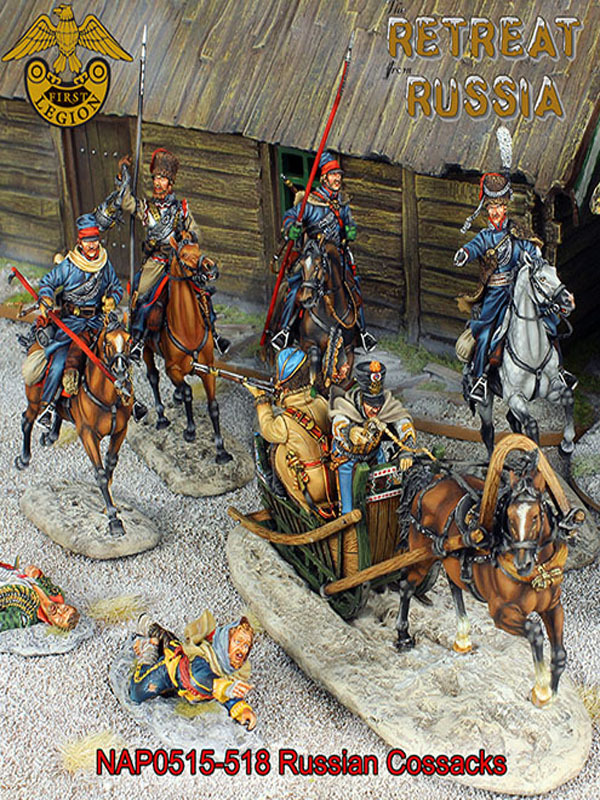 We are pleased to present the Russian Don Cossacks of the Napoleonic Wars. During Napoleon's invasion of Russia, the Russian Cossacks were the troops that the French feared the most. Not heavy battlefield cavalry, but rather used effectively as light cavalry, the Russian Cossacks constantly harried the French forces both during their advance and, as we have portrayed them here, during the Retreat. Operating both in direct support of the main Russian field armies as well as behind the French lines as a very early example of guerrilla troops, the Cossacks were extremely effective and played a key role in disrupting supply and interrupting communication. Though we have done these figures under the banner of our Retreat from Russia range, they can be used for a much broader selection of the period. However, as part of the Retreat Series, these figures are painted to an incredibly high level and perfectly match the French Infantry and sledges which we've already released and make a wonderful addition to the Retreat from Russia series of figures.